Rosetta mission 'FINISHED'. Unmanned spacecraft ended its mission with heroic action, by crashing to the ice surface of comet 67P. Rosetta mission control in Darmstadt has not been able to confirm when the final seconds Rosetta occur. Contact with the aging spacecraft was abruptly broken off (which indicates the occurrence of damage). A few hours before the collision occurred, Rosetta was sending a number of high-resolution images, are also a series of measurements of celestial bodies that resemble a giant chunk of the dirty snow. "Goodbye Rosetta. You've done a good job, gave best contribution to space science," said the European Space Agency (ESA) mission manager, Patrick Martin, as quoted from BBC on Saturday, October 1, 2016. 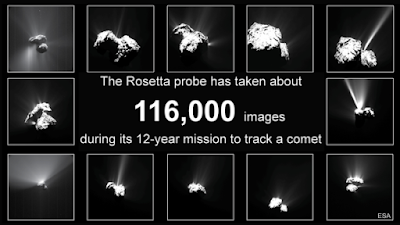 Martin stated the mission of Roseta at Comet 67P has ended successfully. The researchers hope the data collected by Rosetta within its journey to the comet 67P in the last two years will be used for decades. Its loss of signal, which occurred on Friday morning, September 30, 2016 at 11:18 GMT greeted muffled cheers and handshakes of the ESA staff. 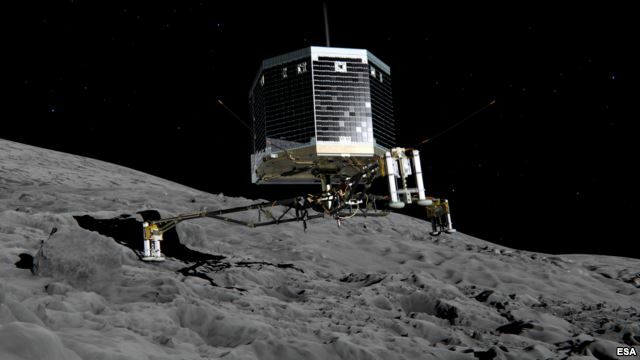 The completion of the Rosetta mission will also mean the end of the scientist task. "People are feeling sad, and proud to have completed this mission," said ESA's senior adviser, Mark McCaughrean. 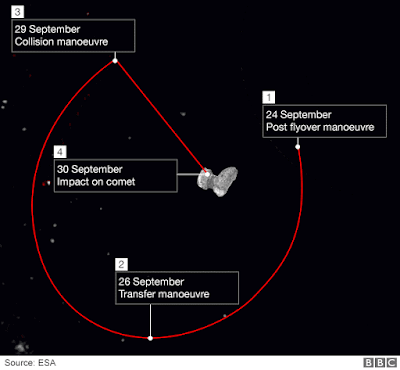 During Friday morning, the instrument team follow each round and changes in motion of Rosetta, when it tried to land on the 4-kilometer-width of duck head-shaped comet. The researchers want to lower the spacecraft, in order to observe the inside of one of the holes that give rise to the impression of patches on the surface. The sinkhole that is the point at which 67P ejects gas and dust into space. Scientists consider it as an opportunity to peek inside the comet. Some pictures successfully sent by Rosetta, only a few seconds before the collision occurred. The photos will have a resolution that can be measured in millimeters. "Super-duper," said Holger Sierks, head of the Osiris camera team. "My neck feathers shiver when thinking about all that," as he told to BBC News. 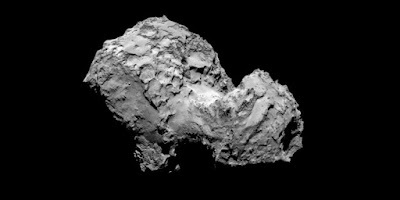 The comet 67P/Churyumov-Gerasimenko was the complete nama of these celestial body and currently heading away from the Sun. Its position limit the solar energy available for Rosetta, which is used to operate the system. Make the spacecraft becomes limp. Scientists initially have the option to make the Rosetta hibernation or let it die slowly. However, according to ESA scientists, Matt Taylor, if Rosetta 'put to sleep' and then woken up again when 67P re-entering the bright territory of solar System, there is no guarantee the technology will still work fine. So, they decided to end it with a reckless action that ended up crashing. Because Rosetta is not designed to land, some of the structure of the plane most likely broke on the initial contact with the comet. Rosetta arrives at 67P in August 2014, after a 10-year journey from Earth. Over the years, it reveals the secrets of the behavior, structure and chemistry of comets. Rosetta even dropped a small robot named Philae to the surface of the comet in November 2014 to gather additional information (the historic first in space exploration).